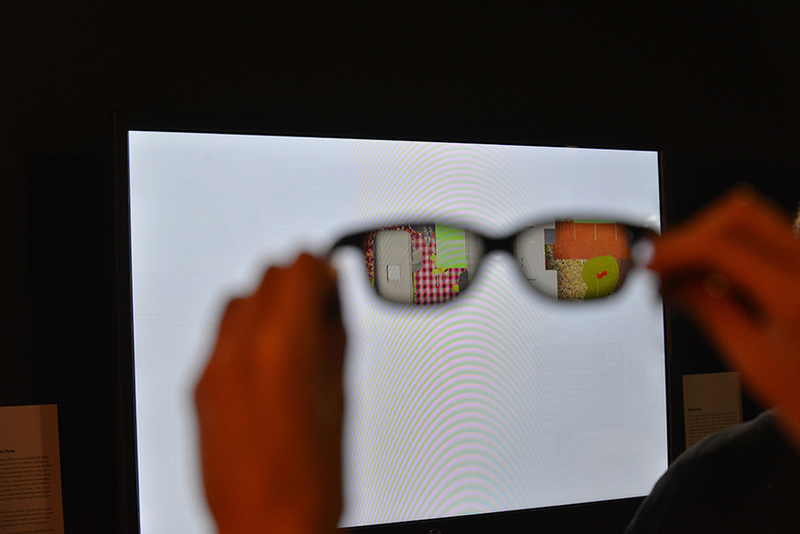 Hacking Geodemography exhibition at Taubman College, 2013. Image courtesy of McLain Clutter, Master of None. Over the past several decades the use of geodemographic data has become common in the regulation of urban land use and development. Defined for this discussion as the study of the geographic distribution of demographic data, geodemography is increasingly influential in determining the character of the built environment.1 City planning commissions use geodemography to aid in the implementation of policy, and private corporations reference this data when purchasing, selling or developing real-estate. Demand for geodemographics has created a vast governmental and corporate apparatus engaged in the collection, collation and amalgamation of data. Among the products of this apparatus are commercial market segmentation data sets: complex combinations of census data, consumer-spending statistics, figures scraped from Internet usage and many other sources.2 Market segmentation sets amalgamate data to describe synthetic consumer identities, and link these identities to their spatial locations in urbanized areas. In an attempt to make the distribution of identity across geographic space scientifically knowable, these data sets privilege extant quantitative variation over latent qualitative difference, and accept as scientific fact naturalized distinctions about race, gender and ethnicity. When market segmentation data is used to influence site selection, the resultant buildings are profoundly instrumental in targeting new, synthetic identities. The shopping malls, big-box outlets or fields of coffee houses that result encourage predicted consumer behavior, becoming territorial beacons for the collection of a specific combination of consumers. United in space, this mix of consumers becomes the synthesized identity described in the operative geodemography.3 Thus, development guided by geodemographics forges a complexly solipsistic relationship between constructed consumer identity and the construction of the built environment. These practices serve to reify artificial sociocultural divisions based on the categories of data collection, and limit urban development to the repetition of conventional consumer building formats. Aerial photograph of Detroit. Image courtesy of McLain Clutter, Master of None. Detroit’s domestic vacancies. Image courtesy of McLain Clutter, Master of None. Detroit’s financial and physical blight is well known. This condition is confirmed in the geodemographic data documenting the city’s residents. Nationwide, one major source of geodemography is the household unit, from which data is gathered through the monitoring of package deliveries, Internet use, television viewing and other activities. Among Detroit’s most salient physical problems is the massive number of domestic vacancies throughout the city. These vacancies not only amount to a vast network of spatial voids, but also a network of data voids. 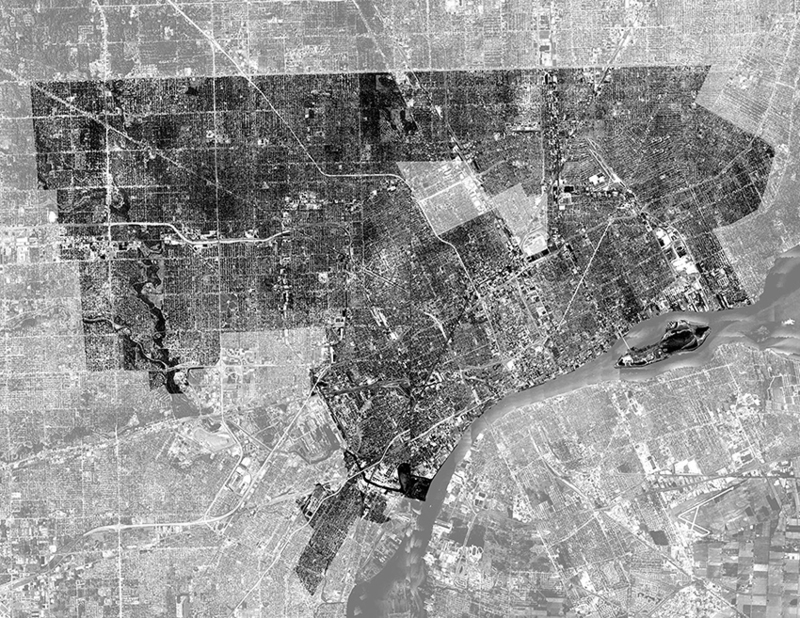 Thus the dearth of data produced by Detroit’s evacuated neighborhoods, and the relatively low consumer expenditures by the city’s poor, reiterates Detroit’s physical conditions. The conventional application of geodemography therefore might recommend little in the way of future development. This constitutes a vicious cycle between blight and one metric that might be used to counteract such blight. 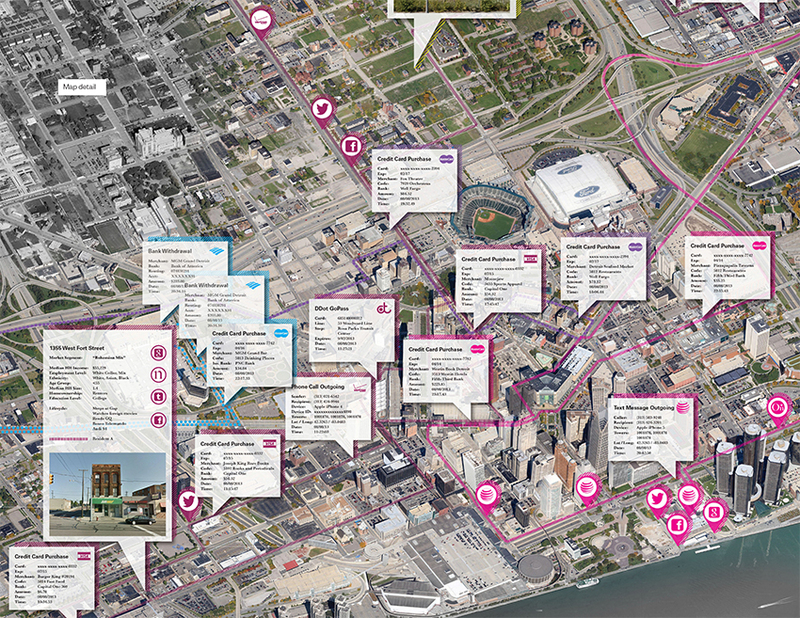 A set of maps used to assess how Detroit’s present urban context supports activities contributing to the prevailing image of the city’s neighborhoods in conventional market segmentation sets. From these mappings, three sites have chosen for occupations that produce data to subvert their received data-images. Image courtesy of McLain Clutter, Master of None. Map detail. Image courtesy of McLain Clutter, Master of None. Hacking Geodemography is a speculative research project that forwards strategies to intervene in this vicious cycle. The work consists of three parts. 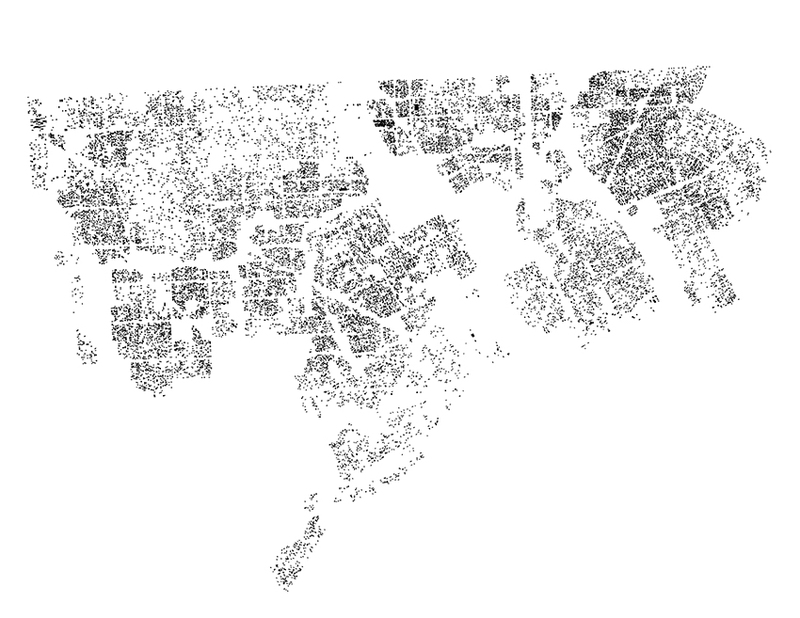 First, a set of maps assess how Detroit’s present urban context supports activities that contribute to the prevailing image of the city’s neighborhoods in conventional market segmentation data sets. Shown above, these maps confirm that Detroit’s consumer landscape is highly tailored to reinforce constructed identities in commercial market segmentation. Second is a map the corporate apparatus of geodemographic collection and aggregation. Represented in a video below, the map is pieced together by hundreds of pages of industry white papers, journalism and prior scholarship. The map explains the myriad relationships between the vast network of corporate and governmental interests involved in geodemography—highlighting their interconnections with contemporary real-estate development. The Apparatus of Contemporary Geodemography from McLain Clutter on Vimeo. Here, an incomplete record of governmental and corporate actors involved in the geodemographics industry has been gathered, and each actor has been briefly explained and organized on cards on a wall. The adjacencies of the cards are based on the relative commonality of the services they provide—to explain the relationships between the network of corporate and governmental interests involved in contemporary geodemography and their connections to contemporary real-estate development. From this map, activities that might be hosted in Detroit’s domestic vacancies have been gleaned in order to produce aberrant data. 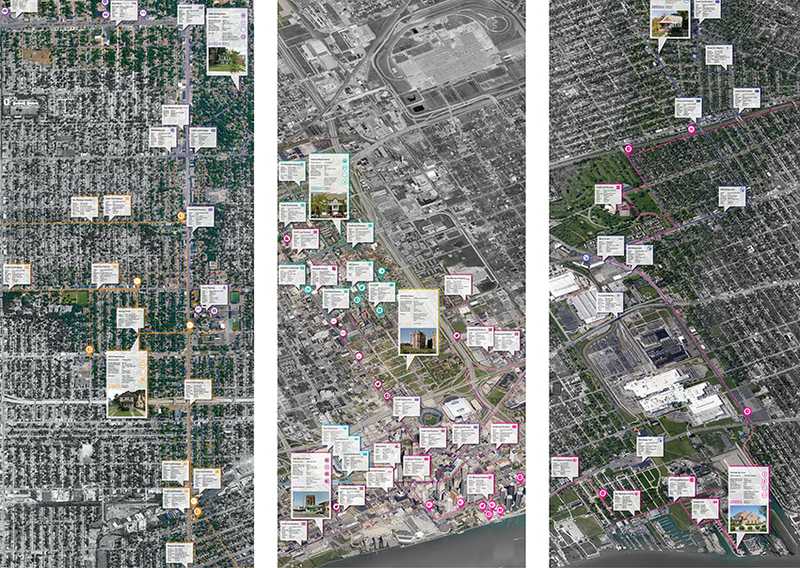 These two mapping exercises inform the third and final part of the project: the design of three transgressive occupations of Detroit’s domestic vacancies. 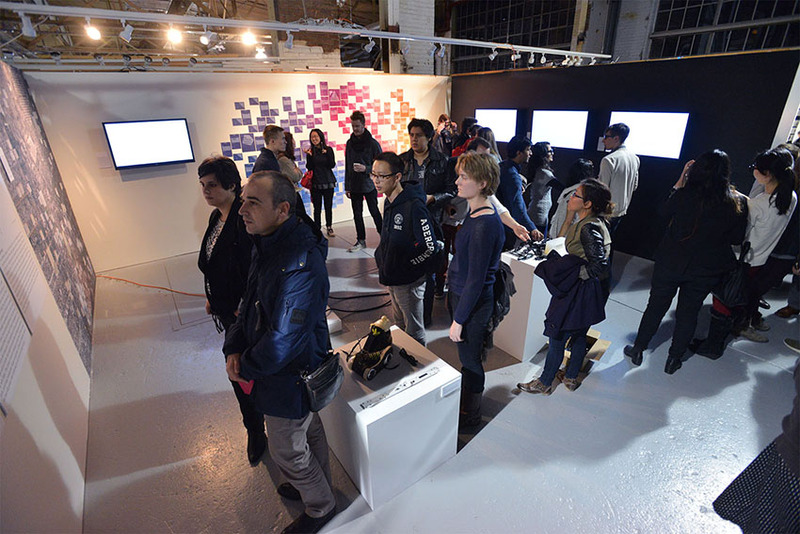 Each site was chosen based on an assessment of Detroit’s consumer landscape, and each program derived from an understanding of the activities that produce consumer data. Each occupation is intended to produce data, which eschews its site’s present data-image. In one sense, the design of each occupation should be considered on its own terms. Each forwards vital urban conditions that re-project the potentials of Detroit’s vacancies in a novel manner. But the real design project is in the concoction of data produced by the occupations. The physical environment is designed to carefully seed urban space with data to encourage new forms of urban development—forms that might scaffold new, heterogeneous and even agonistic forms of public life. In this way, it is hoped that the built environment can assume new agency vis-à-vis the expanding hegemony of urban data. Prairie Santa Rosa from McLain Clutter on Vimeo. Prairie Street and Santa Rosa Drive. Prairie Street and Santa Rosa Drive, between McNichols Road and Puritan Street, is located in northwest Detroit. In order to subvert the characterization of this neighborhood by conventional market segmentation—as one populated by young immigrant homesteader families with highly routinized and prescribed consumer behavior—this occupation inserts a swell of itinerant aged individuals around whom intense and unexpected consumerism may flourish. The area is imagined as a cooperative retirement community in the form of a networked trailer park. The cooperative is composed of four nodes—one for residence, one for healing, one for civic and religious functions and one for recreation. The occupation attempts to blend into its relatively intact surroundings. When completely vacant land parcels are appropriated, faux residential facades are erected to address the street. Meanwhile, the back yards of these parcels, and those of adjoining lots hosting vacant houses, are combined to constitute the occupation grounds. Each node is then designed as a rich spatial interplay of temporary trailers and a gradient of semi-public and private spaces defined between, centered on a back alley that is the primary transportation spine for the occupation. The vacant residences around the site are hacked into for their utilities, and critically, they become the addresses through which data is recorded. Alfred from McLain Clutter on Vimeo. Brush Park. Detroit’s Brush Park neighborhood is directly northeast of downtown. Populated in the nineteenth century by the city’s elite, the area is now mostly evacuated, with a sparse array of aging and vacant mansions spread across several blocks of fallow land. According to commercial geodemographic market segmentation, this neighborhood predominantly consists of low-income minority families of three to four people, whose wage earners work in the white collar and service fields. Some have partial college educations. They often drive Kia automobiles. They rent their homes, shop at drug stores, watch soccer and Univision and read Star magazine. This occupation produces data without physically occupying the site. It is an occupation without human occupation. Technologies that are commonly used to collect geodemographic data have been hacked and deposited on the site under the guise of everyday urban detritus. Though the site appears starkly empty, its data production projects an image of vital urbanism and demographic diversity. XChalmers Chelsea from McLain Clutter on Vimeo. Chalmers and Chelsea. This area is imagined as a cooperative camp of urban scrappers. Scrappers, urban prospectors who harvest the city’s detritus for its material value, are notorious in Detroit. However, the economic effects of their feverish work rarely registers within conventional geodemography. In this occupation, their presence is made physical, and their work visible in the data produced by the camp. Its aim is to confuse the characterization of this neighborhood in market segmentation as one that is populated by individuals past their productive years and of low value as consumers. This scenario instead projects and hosts a dynamic influx of production and unexpectedly vital consumerism. An array of temporary structures including tents, trailers and sheds is scattered across available land on the site, organized according to an underlying hexagonal grid. This geometry overlays a new urban organization on top of the existing city— utilizing side yards, back yards and alleys, and absorbing and reinterpreting existing structures across the site. Over time, the geometry of this new urban organization is made extant by use, patterning the land through wear and surface treatments constructed by the occupants. Similar to Prairie Street, the existing residential vacancies across the site are hacked into for their utilities, and function as the addresses through which data is recorded.